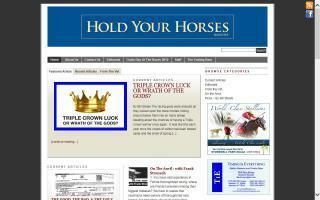 Thoroughbred Racing Directory - O Horse! Horse racing and breeding information from The Blood-Horse. 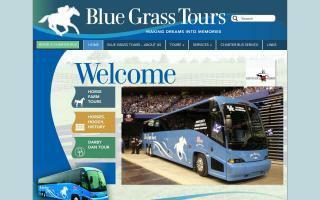 Let us provide the transportation and/or guide service as you enjoy beautiful horse farms, world famous racetracks and equine sales companies, historic downtown Lexington, and the Man O' War statue within the Kentucky Horse Park. Case The Race offers new and truly different thoroughbred handicapping data - based on biomechanic technology and suitable for all levels of handicapper. 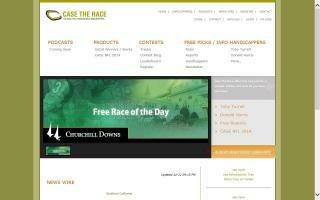 Everyrace.com provides comprehensive form guides on a daily basis for all Australian thoroughbred racing. Handicapping reports, selections and analysis for every track in North America. Hold Your Horses Magazine is our way to give an easy going equine venue to people who love horses and embrace the Thoroughbred world as a way of life, not just something to pass through. We know that not everyone owns horses, but we do know that the horse brings out the best in all of us. We hope that Hold Your Horses Magazine will bring a smile to you on even the worst of your days. Our goal is to provide easy, informative reading while recognizing the people who stand out in the equine world. 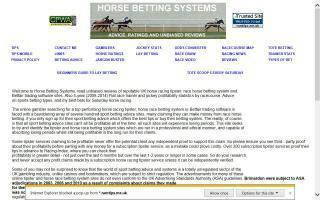 Unbiased reviews of horse racing betting systems. Also 5-year (2002-2007) UK flat race trainer and jockey performance stats by racecourse. Betting advice. Racehorse and horse conformation (form to function) based on bone structure, stride, power, athletic, distance, and balance ratings.